Schools, as politicians frequently point out, are at the heart of the community. When a school closes, or is put into Special Measures by Ofsted, the impact on the community can be profound. Once upon a time, the relationship between the school and community was seen as symbiotic – the school supports the community and the community supports the school. Over the last few weeks, however, it has become obvious that in many places this feeling of mutual support no longer exists. The school is there to provide for the community; the role of the community is to monitor and, generally, disapprove. With an institution as successful as Woodroffe, and in a part of the country largely free from the social problems troubling other areas, one would like to think that the community was firmly on the side of the school and its staff. Ultimately, I am sure that it is; there are times, however, when the opposite seems true. As you will be aware, some difficult decisions have had to be made recently – decisions which have been made in the best interests of the school and its students. The closure of gym as a community facility is a case in point. With increasing attention focused on safeguarding in schools, and calls for much tighter site security, it was obvious that it would no longer be possible to offer the use of the fitness suite and the sports hall to casual visitors. A school where unknown adults are allowed to wander all over the site unsupervised would have to be seen as failing in its duty to keep pupils safe. That was the situation here: unknown adults, who did not sign in, were free to access school facilities, free to go into the changing rooms, and free to visit classrooms. The closure of the school’s facilities was therefore inevitable. More recently, the Combined Cadet Force, has suffered a similar fate, though for different reasons. With key staff leaving the school, it became clear that running a school CCF was no longer possible. Hundreds of hours of staff time were spent exploring ways of making it sustainable but to no avail, and, in the end, we had to accept that the only sensible course of action was to disband. In both cases, the response of the community was to rail against the school. Instead of sympathising with the school’s decisions and seeking to understand the reasons behind them, the approach was to assume that the professionals who run the place clearly have no idea what they are doing. There is also a stunning lack of perspective here: the numbers using the gym after school were, in fact, tiny; the number of students involved in the CCF very small - this year 22 took part in the army camp, 11 in the RAF camp (from a school population of 1050). The dichotomy between Woodroffe’s undoubted success and the generally negative attitude of parents and members of the community can be hard to fathom. I sometimes think that my job title would be more accurately expressed as Complaints Officer rather than Headteacher. Over the past few weeks, instead of celebrating an astonishingly successful year, I have been dealing with councillors, LA officers, army officers and our local MP. I have been vilified on social media, threatened with complaints to Ofsted, and bombarded by helpful suggestions from people who inevitably know only half the story. And yet, The Woodroffe School is one of the most successful schools in the country. Is the community aware of that? Last year, our GCSE results and our progress scores were the best in the county. In fact, however the data was presented, Woodroffe was top of the list of Dorset’s 22 secondary schools. And we have every expectation that it will be the same this year. Our exclusion rates compared to other schools are exceptionally low; our attendance figures high. We are full in every year group and there are waiting lists for school places. With many schools in Dorset in danger of financial collapse, Woodroffe has managed to avoid a deficit budget. We are rated outstanding by Ofsted and, though this was a judgement made several years ago, my experience as a Lead Ofsted Inspector tells me that we would retain our outstanding status were we to be inspected again. Behaviour, by any measure, is excellent across the school and our students are generally delightful. It is rare for us not to receive positive comments from the managers and owners of the places we visit or the activities we take part in. There is, of course, some bullying in the school – largely nowadays confined to social media – but, as Ofsted put it, it is rare and dealt with immediately and very effectively. Woodroffe staff are committed and highly skilled. All teachers are subject specialists and the standard of teaching here is exceptionally high. That is why we operate so successfully as a Teaching School and a Maths Hub. We also support many other schools across the region, including those that have fallen into special measures. Not only do our students do well academically, they have a great time. They also leave here fully prepared for their next steps and ready to face the future. And staff provide constant support. Plus, the ‘usual’ offer of sports, music, drama, and other clubs and activities which run throughout the year. 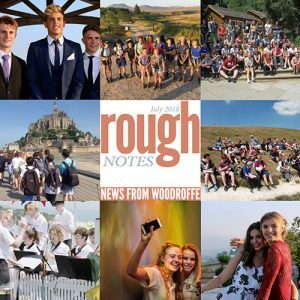 A glance through this and every edition of Rough Notes amply demonstrates the success of the school. Isn’t it time the community saw the bigger picture?